Would you like to stay at a true traditional Japanese house? We can offer it to you!!! We have a fashionable bar lounge area. Locals come and drink at this bar lounge area. You can talk and make friends with Japanese local people and tourists. The wooden and traditional building was built in 1920 and renovated in 2010. We have a large Japanese garden full of greenery, singing birds, and beautiful koi in our pond. There is a rocky mountain which consists of stones from Mt. Fuji; it is genuine part of Mt. Fuji and has been registered as Japanese important cultural tangible heritage by Japanese government. 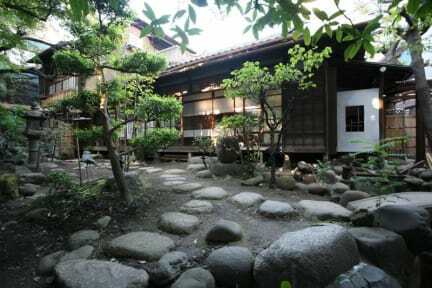 In Tokyo, a metropolitan city, this type of historical and traditional building and garden are very rare. You can enjoy the calm atmosphere and feel the real Japanese experience. 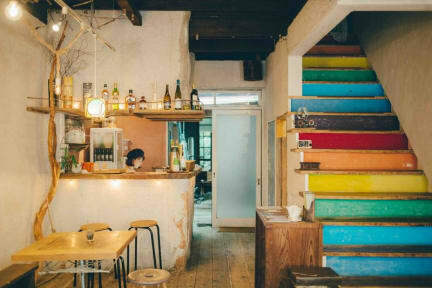 Let\'s have a lot of fun in bar area and relax in Japanese traditional house. This is a truly memorable place to spend your precious time. 1 minute walk from Iriya station of Hibiya line. 7 minute walk from Uguisudani station of Yamanote line. 15 minute walk from Ueno station of Yamanote line. We accept MAXIMUM 4 people in one group. Even different bookings will be recognized as one group. ・30% cancellation fee of the room or bed will be charged if you cancel your reservation 2 days prior to your reservation date. ・50% cancellation fee of the room or bed will be charged if you cancel your reservation 1 day prior to your reservation date. ・100% cancellation fee of the room or bed will be charged if you cancel your reservation on your check in date. Special Reminder: When you make your booking, please fill in the name in English spelling as on your passport. The most amazing hostel I've ever stayed at, and I've stayed at dozens!! Such a beautiful building, peaceful but social atmosphere, comfy bed spaces, great bathrooms/showers and kitchen. Very secure. The attention to detail is exceptional, such a welcoming environment! The staff are all incredible, so friendly & attentive, and the breakfasts are AMAZING, hand made from scratch every morning and served with such care :) definitely worth the 400 yen! I had a fantastic stay, will be coming back! This hostel is a perfect example of how a good hostel should be. Accommodating staffs 100%, comfy bed, cozy place, clean bathroom and shower room, and everything, just everything. This hostel is just so easy to locate from Uguisudani station and 0 min walk from Iriya station, how convenient is that? Plus there's living&bar! Ughhh! Such a beautiful place, very relaxing and comfortable. The staff were so kind. Great place to stay for a nice quiet night when you need a break from the craziness of the city. Very clean! Beautiful hostel, was immaculately clean. Staff were very helpful and easy to talk to. Location is not great if you want to go to Shibuya or Shinjuku but is well situated for ueno and chiyoda plus it is very close to both a JR anf a metro station. Very well priced breakfast. My only problem was the lack of heating in the building but free hot water bottles and electric blankets were provided to compensate for that! I’ve been wanting to try Ryokan (Traditional Japanese Inn) but it’s too expensive so I gave this hostel a try. I love the details of every corner of the house. Wooden floors, sliding doors and a Japanese garden with Fujizuka (small scale replica of Mt. Fuji). The rooms and bathroom are clean, staff are really nice. Will definitely go back here. Overall, I love the atmosphere. A 100 year old Japanese house with a beautiful courtyard garden. It's kind of living with a Japanese family. The host is very friendly, introducing me to every corner of the house. But one problem that I had was I had to checkout early in the morning and the shower room is only allowed to be used starting 7am. I loved the atmosphere of staying here!! The girls who worked there were lovely and going there from the airport was quite easy!